Good versus evil. The meaning of life. Faith in God. Undertake these discussions and more. Courses in religion explore traditions around the globe. Students who choose a major or minor in religion at Wilson College will dive into questions that have plagued humanity for ages: What is the role of religion in public life? What should we do about inequality in the world? What is the meaning of life? Often coupled with interdisciplinary courses in philosophy, religion classes deepen students’ understanding of religious traditions most often associated with western culture and values, as well as minority and nonwestern religions. 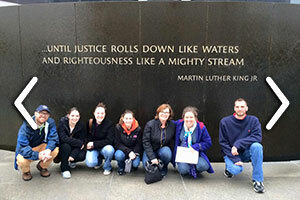 Students traveled to Selma, Alabama to for an experiential learning course to study the activism of Dr. Martin Luther King, Jr. The class examined the social and political dimensions of King's religion, including prayer, party politics, and nonviolence. Students filled journals and blog posts with personal reflections, essays, photos and mementos to document their spiritual "pilgrimage" to these historic sites. Read more about the trip in Wilson Magazine. Frank Furedi, whose influential books The Culture of Fear and Paranoid Parenting investigated the interaction between risk consciousness and perceptions of fear in contemporary society, will present two talks exploring fear on Monday, April 16, at Wilson College as part of the Common Hour series of lectures. Both will be held in the college library's Lenfest Learning Commons and are free and open to the public. Lancaster Theological Seminary professor Lee Barrett will deliver two lectures about anxiety as part of Wilson College's Orr Forum on Monday, Nov. 6. The talks, which will be held at noon and 4:30 p.m. in the college library, are free and open to the public.